When visitors enter the Universal Building today, they are greeted by the words “Cribben And Sexton Company” etched prominently into the building’s stone façade. These names and the company they represent are now long gone, but we are still proud they adorn our building almost 115 years after it was built. 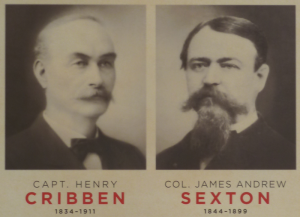 Henry Cribben and Col. James Sexton were prominent Chicagoans and accomplished businessmen. They both came from very humble beginnings to eventually stand atop one of the largest industries in the nation. Both were decorated veterans of the Civil War and both held prominent civic and public positions in their time. In 1898 they built what is now the Universal Building to house their expanding stove manufacturing operations. Although the building’s purpose has ultimately changed over the years, from manufacturing to classic loft offices, we still feel a very close kinship to its original founders, and great Chicagoans, Cribben and Sexton. The story of Henry Cribben starts in Rochester, NY, where his family relocated from the Isle of Man in 1838. Just four at the time, Cribben was soon met with hardship as both of his parents died within a few years of the family’s arrival to the United States. By the time he was 12, Cribben was supporting himself in a number of manufacturing positions throughout the Rochester area. At 17, he began learning the trade of iron molding. He would remain in this trade for more than 10 years, until the outbreak of the Civil War, when Cribben enlisted as a sergeant in the 114th regiment of New York. Eventually, he would be promoted up to captain for his exemplary record. He saw frequent action in his military career, participating in the battles of Fredericksburg, Chancellorsville, Gettysburg, the Wilderness, and Bethesda Church, where he was taken prisoner in June of 1864. Cribben would spend eight months in captivity, being shuttled between seven different Confederate prison camps, until he finally managed to escape on February 11, 1865 near Charlotte NC. He then spent 37 days traversing the wild mountains of North Carolina and Tennessee, finally reaching Union lines at Knoxville on March 17, 1865. Even after his harrowing experience, Cribben decided to rejoin his regiment and he served until the end of the war. He would later write a memoir capturing his wartime experiences. After the war, he founded his own company in 1867 in Rochester, the Rochester Cooperative Foundry Company. James A. Sexton was born in Chicago in 1844 and spent his youth and formative years there. His middle initial was a reference to President Andrew Jackson, whom he was distantly related to on his mother’s side. Much like Cribben, he lost his parents at a young age as he was 17 when they both passed away. Shortly after their funeral, he decided to join the Union army as a private. Sexton would become a decorated Civil War veteran, taking part in seven battles, including The Battle of Spanish Fort in Alabama, where his left leg was broken by a piece of shrapnel. When hostilities ended, Sexton left the army as a Colonel. In 1871, just after the Chicago Fire, Cribben made his way to Chicago and realized that it had many advantages over Rochester for its distribution capabilities. He then decided to start a new company in Chicago and invited Sexton, who had been working as a salesman in his Rochester company, to join him. Thus, Sexton returned to his home and the two men founded Cribben & Sexton Co. in 1873. Originally stationed on Erie Street, the business manufactured steel and cast iron parlor stoves, cooking stoves and heating stoves for both wood and coal. By 1880, the business was producing 40,000 units a year and was wildly successful. At the turn-of-the-century, stoves were the big-ticket consumer item. That may be hard for us to visualize now, but at the time, wood burning stoves, and especially coal burning stoves, were cutting edge technology and provided services and functions that had only recently been luxuries. Today we like to show off our cars or new electronic ware. Then…it was stoves. Both men became prominent and influential figures on the Chicago scene. In 1889, Sexton was appointed Postmaster of Chicago by President Benjamin Harrison, a post he held for five years. In 1891, Cribben was elected the first president of the stove manufacturer’s association. The business continued to expand and the company broke ground on the Universal Building at 700 Sacramento in 1898. Unfortunately, that same year, ill health caught Sexton and he sold his portion of the business to Cribben’s son, William Cribben. The following year, he died in Washington D.C. at the relatively young age of 54. It was noted in his obituary in The Daily Argus News that President McKinley sent flowers from the White House to his funeral. The business continued to prosper after Sexton’s death, employing 500 people by 1900. Cribben slowly transitioned control of the company to his son and settled in nearby Oak Park, Ill., where he died in 1911. Since then, the building has passed through several different uses, manufacturing everything from plastic containers to consumer toys. In the late 1990s, the building was in serious disrepair and was slated for the wrecking ball. That’s when current ownership stepped in and purchased the building. After several years of rehab and a lot of love-and-care, it was successfully repurposed as a classic loft office building. Today, it houses several unique and creative firms looking for professional and affordable space and enjoy being in a building with such a storied history. For more information about leasing office lofts in The Universal Building in Chicago, please call 773.342.2020.